What if You Could De-Stress in 5 Minutes By Taking a Simple Quiz? Stop feeling scattered, scared of decisions and unsure of what to do next. 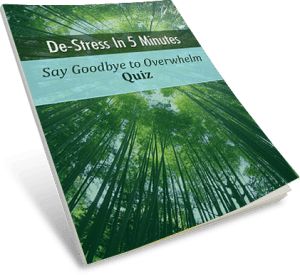 Take the﻿﻿ 'De-Stress In 5 Minutes' quiz to reveal which of the 6 incredibly simple ways is your single best way to de-stress today. Yes! Give me FREE INSTANT ACCESS NOW!